I don't know where this came from but I had to write it down. I want to know more and honestly I need to know if this idea can take me anywhere. Maybe I will start from the beginning of Harry and James' relationship and see where it takes me. Please excuse my writing, I can’t stop my hands from shaking because I’m cold and I’m alone tonight. A dark figure wrote, but the ink was blotchy and ran off the page. The room shook again and was a blaze with a fierce orange light, however the figure in the corner of the small attic room hardly flinched. He kept writing almost frantic now, the small light from a flicking candle almost toppled over as the room shook again. I miss you, and I haven’t slept since I last saw you. My dreams are plagued with your face; we did a lot together didn’t we? I certainly learnt a lot from you. Do you remember that night by the lake? When I punched you? It’s all I can think about since you left, because that’s when it all began, this stupid adventure that you dragged me through, but I don’t regret a single moment; it ruined and revived me. You made my life begin darling, and I don’t regret anything, even now as I’m writing in an old attic room, with the world falling around me. I know I promised you I would never be cliché but all I have ever wanted is to be with you, and you never saw that. I know you believed I needed more, but you were all that I needed, I need you to know that. But now its dark, and everyone is telling me to leave, your not coming, I’m not going to see you again, and the worst part is that maybe their right and you don’t want me anymore. I’ve forgiven you and I don’t blame you for not wanting me, and yet I will not leave. I’ve got no place to go, and why should it matter? I will be gone from this world sooner rather than later. I just wanted to see you, one last time my love. But no matter, England will not fall tonight. My death will prevent thousands of lives from suffering, and what was it you used to say "The Needs Of Many Outweigh The Needs Of One." You were right all along… it is not illogical to try and save one at the risk of so many. James, the man of barley twenty-eight, squinted at the writing trying to make sure it was the right words to end a relationship that had swallowed his whole life. But it was all too late and now he wished he had told him these words long ago, before this war, before it was all too late to say goodbye. I love you and please my dearest, never forget me. This is not a letter of guilt, but rather one to say goodbye. One to remind you to remember me not as you see me now, but as I was that first summer, before all of it… before the lies, the deceit and the running. Before… before the fight… back in the hotel room over looking the village in Atlandsa, I hope you remember that night? Because it’s the only memory that has kept me alive these last couple of months, and I hope the memory of my lips keep you awake as much as they have kept me up in the cold night, here in Densia. “James! We can’t stay here any longer, we need to move.” Jenny came hurrying into the small attic room above her house. James looked up almost lost in the memories of warm blue skies and the feeling of the grass beneath his fingertips, and lips that were sweet with the taste of strawberries. But that memory had happened so long ago James had trouble remembering if it was all just a dream. And then it hit him, he knew in that moment that he would never see those green eyes or hear the warm laugh again, tears filled his bright blue eyes in the gloom, but he was strong he would not fall after coming so far for the man who would not say goodbye. “I can’t leave. He wouldn’t want me to leave. "The needs of many outweigh the needs of one.” He whispered the line again, a line that was almost becoming a chant on his dry, cracked lips. Gone was the boy of twenty full of life and ready to fight for his country and what he believed in. What was left, a mere eight years later, was a man who could have been seventy, living in a past that was a lot lighter and had no mention of pain. “I know” the man said tiredly, and felt the tears, which he had tried to stem, form once again in his eyes. “But I can’t leave. You have to go, I cannot keep you safe any longer.” She had tears in her eyes as well. His heart broke for her, they had become close over the last year, but he would not let her fall into the trap he was now ensnared in. “You need to go there is nothing here any longer” he stood and hugged her gently as she placed fragile arms around his broad shoulders. “James come with us, its not too late…” he shook his head before she could carry on, he didn’t want her to break the resolve that his chant had barely created. “I cant you know that,” he swallowed grasping the letter tightly in his hand. “But would you give him this letter? I mean only if you see him or if he comes to find you?” he asked, and was ashamed to find that his voice shook with suppressed grief. Jenny gently took the letter from his shaking hand and he watched as she placed it carefully in her coat pocket. The room shook once again and he grabbed hold of the chair to stop himself from hurting the frail woman in front of his broad form. It was time for her to leave, he gently walked her to the trap door which led to the rest of the house and then with one final frightened look she fled. This town would soon be turned to ash, but he was happy to let it crumple around him. They had found him and he would not fight any longer, he had nothing left to fight for, let ashes turn to ashes. Yet James felt weak and hated it. He had never been a weak man. He had always been a leader to the men that had followed him into the battlefield. Yet Harry O’Shay had changed the whole world around and there was no way he could right it again. Once Harry was gone, James had run and tried so hard to not look back, but life was now dull and meaningless without him. There was no future with or without the man who had strolled into his life all those years ago, and now, as James looked around him at the destroyed house with the sound of the air raid going off outside, he knew that there really was no turning back now. He will be safe, England will not fall, and your mother did not die in vain. This sentence had become the only thing keeping him locked in this room, as the sinking realization that Harry was not coming to his rescue seeped in. A nasty voice inside of his head whispered he has given up on you, like everyone else. James Riley, a hero? Give me a god dam break. But the voice was right; it was his fault, everything that had happened was his Goddamn fault. Why hadn’t he listened to Harry all those moths ago? And why for the life of him did he face this terrible problem alone without the comforting hand in his? But James held on to the idea that his lover would live even with the Riley line dying out with him. And maybe, just maybe, there was an after life. James smiled as he thought of his men and how they used to tease James about his idealistic ideas about there being something more than just the darkness of closing your eyes for eternal sleep. 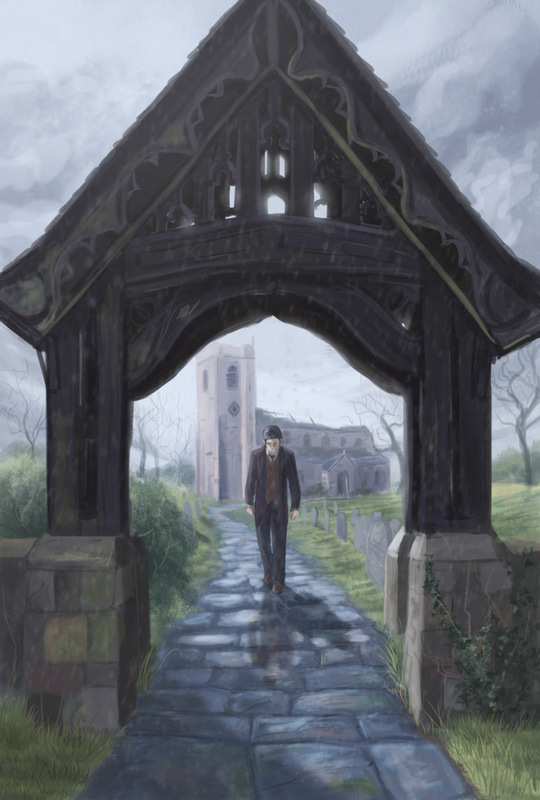 Harry’s hand shook as he read the letter, his own howl of pain ripped through the quite undisturbed churchyard. He was back in England, finally back with the one he loved, but he had let James down. The letter had come too late, and by the time Harry had frantically arrived at the small village in which the letter described there was nothing left. His hands shook, as his body trembled with grief, but the comforting hand on his shoulder annoyed him. No one understood what they went through, James had tried everything in his power to be allowed to be with the one he loved in this hypocritical world that had done everything to destroy them. James had done everything to keep them together but in a moment of pure stupidity it had been Harry who had left James sleeping in that grim Hotel room after their fight. this thought made Harry's knees go weak and he fell to the floor. However he would not fail James again, he would not become the Enobarbus of this story. He would take up his lovers place and fight where he had left off. This morning the war had ended, and Harry knew, even if the world did not, that it was because of his lover. Their destinies really hand been intertwined long before the war, long before they had even met. Destiny, fate or even God, whatever you wanted to call it, Harry had ceased to care after the horrors of war, which, had seemed to burn all that was left of his faith, or so he had believed. Yet with the burial of the only person he had ever truly let inside of his walls, he found himself pleading almost begging, to anyone or anything that may slightly care about what was happening on this violent planet called earth, that James was safe, comfortable and happy. Harry knew this was the least his general deserved, with the sacrifice that he had made to and for his country. He truly was the best man there ever was, and although Harry had no medal or trophy to give his lover, he knew that James’ team, who were waiting for Harry to come back from the side of James’ grave, knew what a true hero he was. James Riley did not die in Vain as Harry O'Shay would always remember the man he loved as a hero and the legend of the team who had lost their leader would last a long time after the members had joined him in the earth.